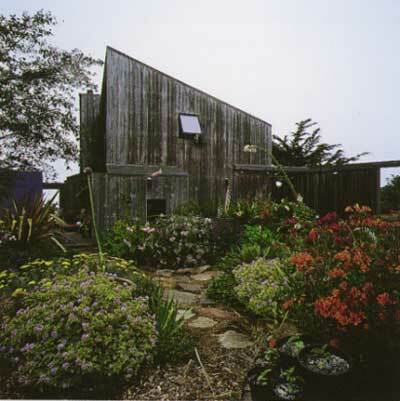 This sea ranch compound house, initially designed for and with Dianne McKenzie, is the first house that I designed for The Sea Ranch after returning from an extended period on the East Coast. 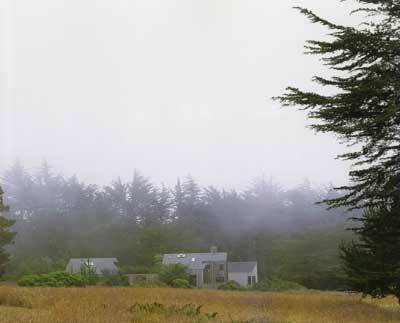 Its site is the edge of a meadow, on a cul-de-sac that parallels a hedgerow. Thus the house site is related to but not adjacent to the trees. Our response was to set the building complex as close to the road as setbacks would allow and to make the gesture of the house’s roof toward the trees sufficiently strong to visually bridge the gap of space, connecting house and hedgerow when seen from across the meadow. Setting the house close to the road, rather than pushing it out into the meadow, also left clear lines of view for the lots farther east along the road. The house is built in two parts across a courtyard, with the everyday living spaces on the western, ocean-fronting side, and a studio/garage on the eastern side. The roofs of the two buildings rise at the same pitch, as though cut from the same plane and bent just a little. That over the narrower house rise up in a single slope toward the southeast, with its maximum height bringing sun into the space through large windows. The studio roof starts in the same plane, but at its peak folds over into a gable; its downward slope encompasses the garage/work space and storage shed. The two buildings are joined by board fences tying the forms together and enclosing the central court. From the cul-de-sac the house presents two aspects; one building reads like a simple barn, the other as a high shed reaching for light and sculpted by appendages, including a walled enclosure to the south, which provides a private wind-protected sundeck with hot tub and a framed view of the ocean. Inside, the main living space is a long high rectangle that steps down gently toward the sea and harbors a mezzanine above with bedroom, shower, and toilet spaces. 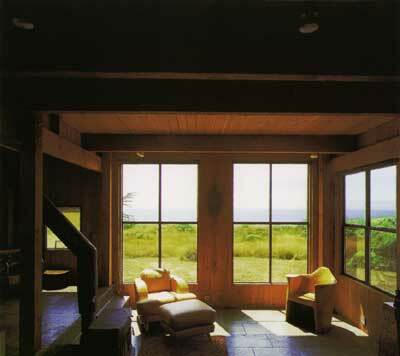 Large, tall windows on the ocean end look out onto a meadow stretching toward the bluff; the opposite end of the room is open to the kitchen across concrete counters. The dining table is located in the middle of the space. From this center of hospitality in the house, the action moves off in all directions. The kitchen equipment is ready to hand on one side, the living area a few steps below on the other. The pairs of French doors, aligned across from each other on opposite sides of the house, create a cross axis through the space: one set of doors leads to a covered north porch and a view to the meadow beyond, the other pair opens to the walled sundeck on the south. Overhead, a bridge passes across the space, and a large, tall window on the southeast lets in the morning sun. It joins a long skylight that garners bright light from the sky throughout the day. Beside the kitchen, stairs climb to the second-level bridge that crosses the length of the space, leading past a toilet room, a long closet, and a freestanding glassed shower to end in a platform that holds the master bed, with an appended niche for meditation. Originally this area was kept away from the wall to emphasize its separateness as an element in the large volume. The studio in the second building is a large simple barn space that becomes very low on the meadow side to create a close nook for the woodstove, and rises up at the peak to cover an attic-like mezzanine study, with its own projecting balcony outdoors. 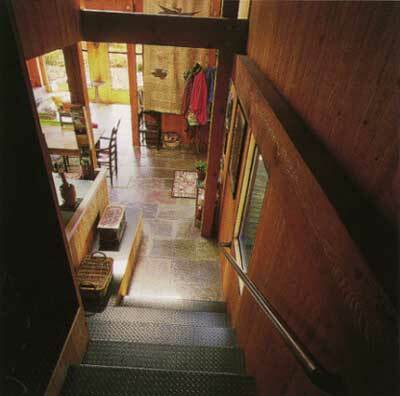 The McKenzie House was built with an exposed heavy wood frame Douglas fir and plank walls and roof, a modified version of the construction system used in Condominium One. Additional materials were informed by Dianne McKenzie’s adventurous enthusiasm and her commitment to experimenting with surfaces. (She has since joined John Halley in Comet Studios.) 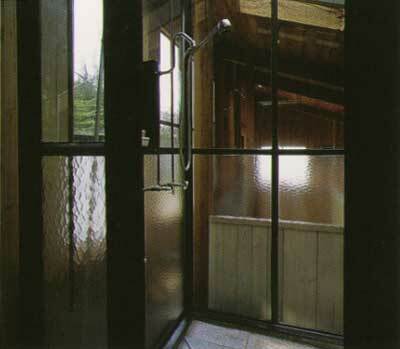 The living-area floors are slate tiles, which have since been used extensively at The Sea Ranch; the counters for the kitchen are cast concrete on industrial supports; the towel bars and accessories are fashioned of copper plumbing tubes; and the lights and conduit are exposed with industrial fixtures. Wink and Laura Franklyn who now own the house, have invested it with another layer of interest. Wink carves big logs into furniture and figures, while Laura has an intense interest in gardening. A number of Buddhist objects inhabit the house, lodged on framing members, in nooks, and ledges, and on walls. The most dramatic transformation under the new owners has been in the walled court, which is now a lush, extravagantly vigorous garden that produces all manner of blossoms throughout the year, suggestive of a northcoast version of Rousseau’s famous jungle paintings. On the south a trellis further defines as garden the area that once was the car entry; cars are now parked in an area outside the walls, thickly screened by pine trees. Great, beautiful chunks of wood in various, stages of being carved inhabit the garden. Small additions, which I have designed, have recently been completed, adding an extension to the studio building and expanding its bathroom. The main transformation in its role in the larger landscape is the addition of a short, windowed tower at the center between the two buildings. It adds another vertical incident, marking the presence of people in the long stretch of wall edging the meadow.